Finally getting around to posting last weeks cleanout. So this stuff has been rolling for a full month now. It could round off a little bit more but it's good enough for my impatient self. Really liking the way the clear glass is turning out. Was planning to push it all through to the polish stages but realized that I didn't have enough material to properly fill the 6 pound barrel for a good shine. So the colored glass has been put aside while I course grind some clear fresnel lenses down. As soon as I have a good quantity of glass I'll push it all through the last 3 or 4 stages of polish. Gorgeous material! Watch out for the long thin bits, they're too fragile to do much with, can snap 'em with your fingers. Controlled breakage with tile nippers is the way to go, hammering glass is a big, big no-no, all those daggers are waste. Looking forward to your results, and totally jealous of those gorgeous colors! Did another cleanout. 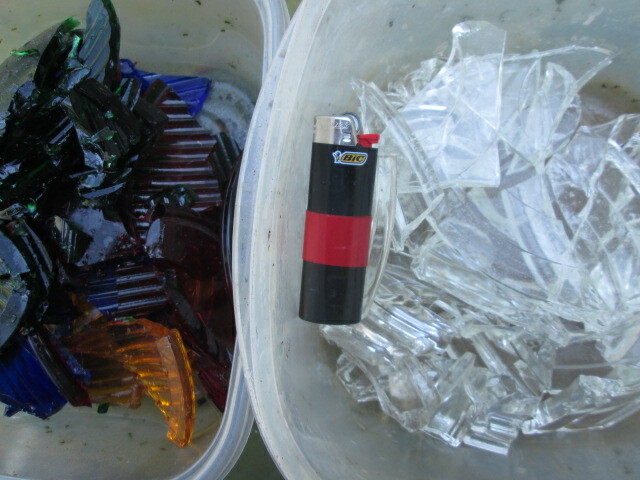 This barrel is still rolling the clear glass that will be used as filler along with the colored glass later. Still not rounded enough to look interesting, so back in the barrel to run another week of course grit. Trying out a lower water level and added a couple of large rocks to try an increase the grinding action. 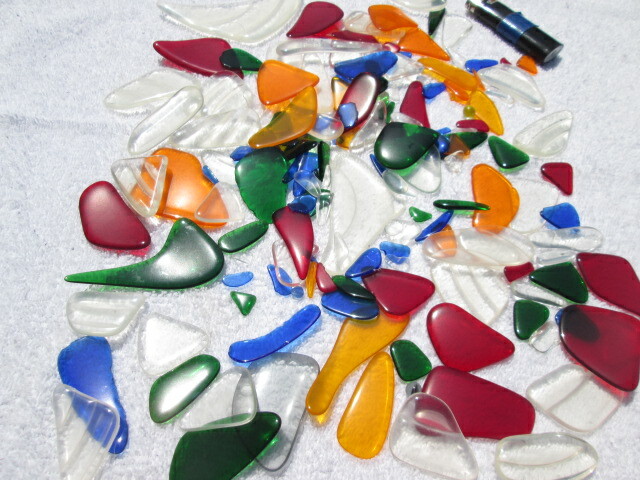 I sometimes think glass takes longer than quartz, agate, etc. in the course grind stage. Do you have a lot of foam build up in the barrel? I'm rolling some glass from the spoils pile of a glass plant and if I don't scoop out or pour off some of the foam every few days it turns into shaving cream. I haven't updated in awhile, but it has been more of the same stage 1 grind, repeat as necessary. Gosh these theatrical lenses are hard. On this weeks cleanout I decided to push it all through to the polish stages. Washed it in ivory soap for 2 days cause I was lazy, normally I will only wash a load for just an hour. This morning I rinsed it off and started it in stage 2 using 220 grit. 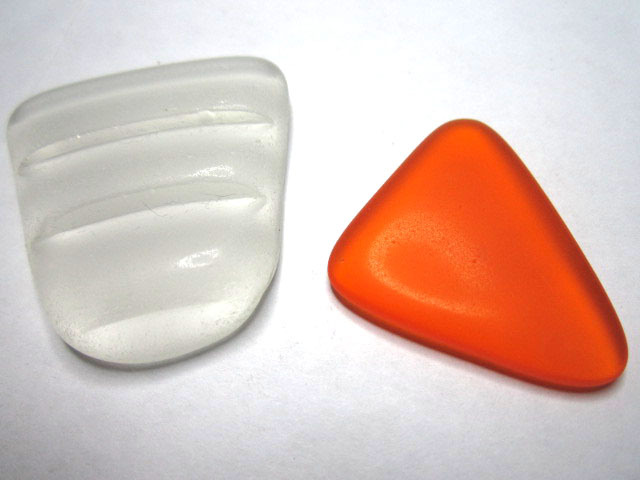 Here are a couple of examples that are about the size of a quarter. Not clear at all but it does almost have some shine to it from the 2 days of washing. Some deep pits can be seen leftover from the course grit. Todays cleanout looked good. The the 220 grit removed the pits from the course stage so it all got sent to stage 3 using 600 grit and plastic beads. sorry but no picture this time. Quick Update--- Last cleanout was Monday, finished a week of SiC600, laid out some pieces to photograph but they looked just like the glass from after last weeks SiC220 run, so no photo, just imagine some finely frosted colored glass parts. Moved it all into Stage 4 out-of 5 using AO 1000 and plastic beads. These should be completely finished with polish stage on Monday April 23, watch for pictures then . . . 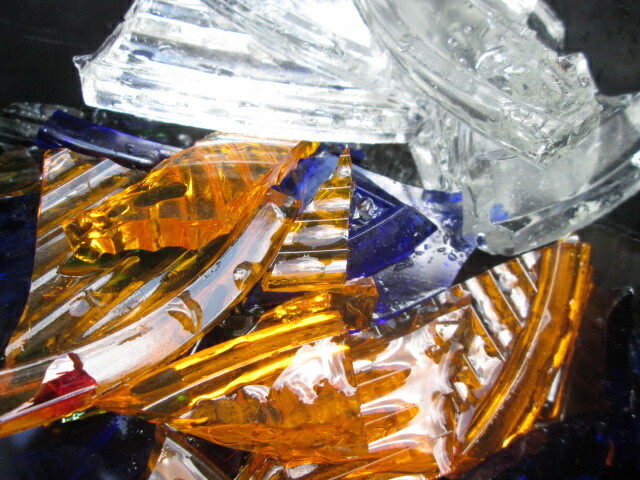 Finally got to the finishing point with my theatrical glass tumbles. Was really wanting to get a Clear Glass finish but it did not come out that clear, but I could be happy with the results depending on how I will use the material in the end to catch light. This glass seemed to be very hard and it took a month in Stage 1 course tumble to round them out enough to push through to polish. So am thinking that all the Polish stages needed to be run for 2 weeks instead of only one. 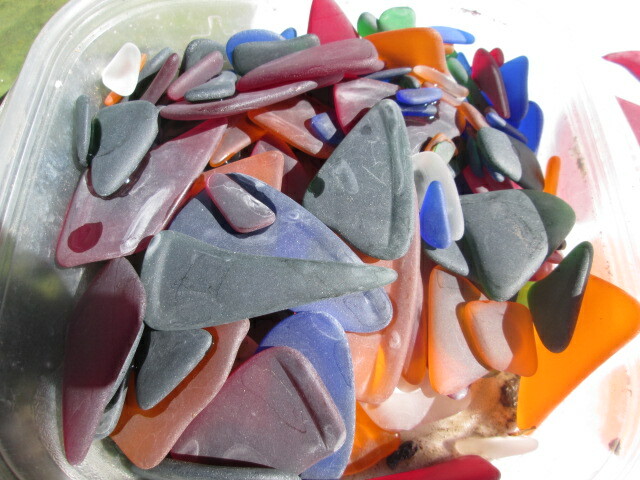 The blue glass is very fragile compared to the other colors. it chipped at the edges and reduced a great amount compaired to the other colors. Nice shine on everything but not very clear. 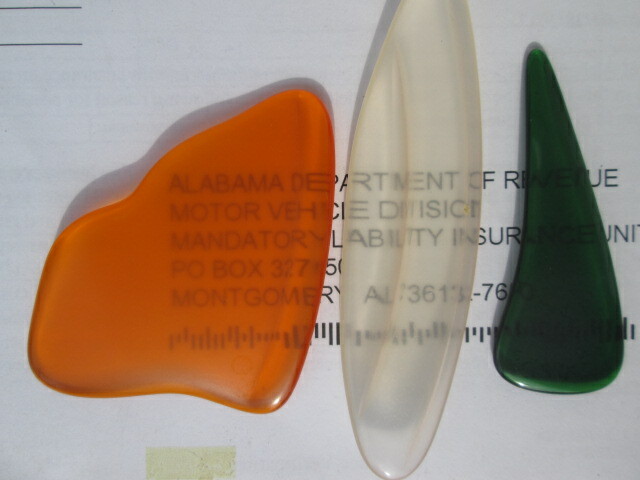 Here is the uncolored glass. It is stained a little bit pink from the Cerium Oxide polish, even though it was washed for an hour in Ivory soap and water. I'm sure it is polish trapped into the almost rough surface. It is interesting that the ripples in the surface of these glass lenses grind down almost flat witout any ripples in the end grind. 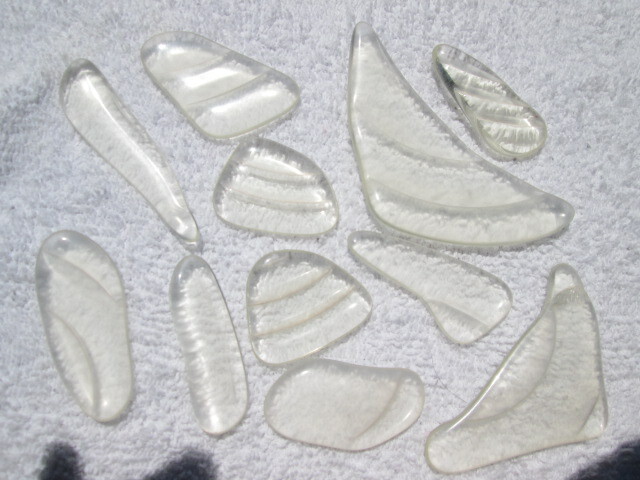 Was trying to make these into clear polished glass but you can see that it is still frosted a lot. 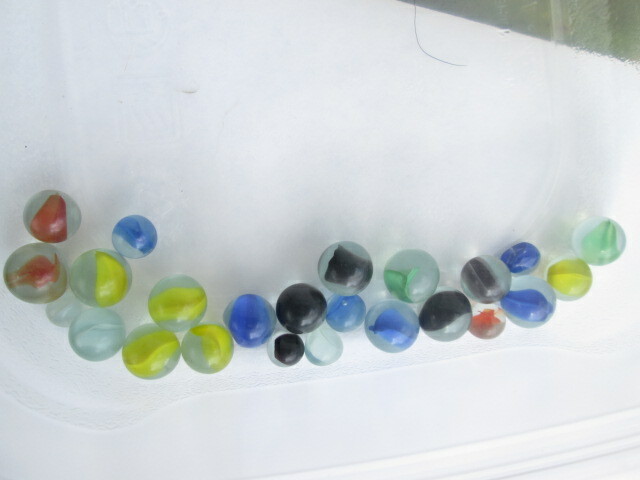 Also using Marbles as tumbling media to help keep the flat pieces from sticking together. They are used an many more of my operations so some are smaller than others. Sorry it took a coupla days to get this posted. Been working Celtec Woman and there has been bad weather for the pictures. So I've had a coupla weeks to show off my frosty looking tumbled Theater Glass along with some of my best Tumble Polished Rocks. the stones are good too but would you sell me some of that glass ? a backlighted panel with a rocket launching on it. The thrust fire under the rocket would start at the top with clear White and gradually change through Orange, Red, Green, Blue colors. 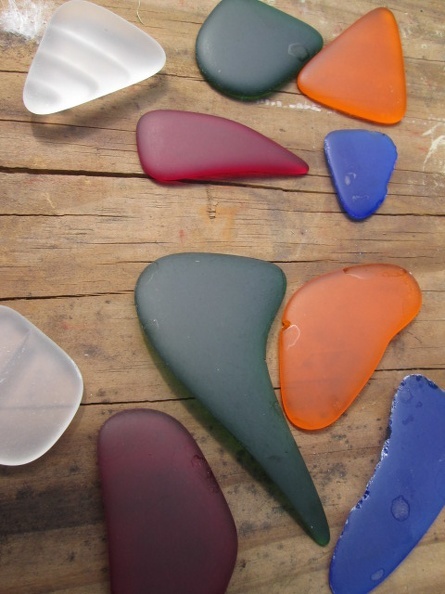 The glass would only be tumbled for one week so it would still would have sharp corners on it. Still working with this idea. I brought home some more glass from some different lighting fixtures, and plan to run this stuff for the next coupla months or so. The last batch ran in Stage-1 Course for 2 months or more. 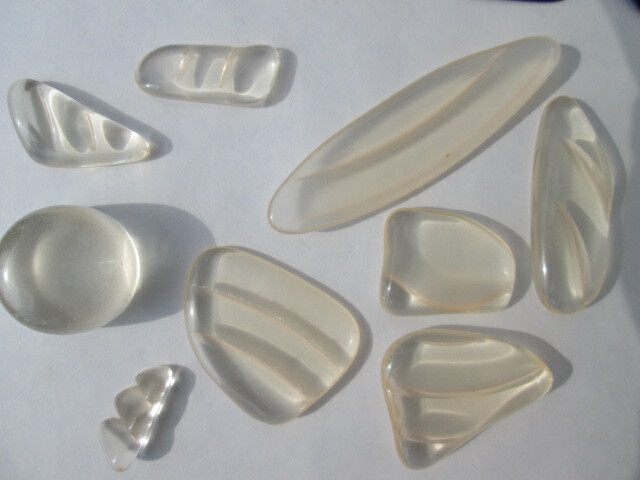 The glass lenses are made of Pyrex which appears to be some very tough stuff. I will not be so concerned about Rounding on this batch and will probably push everything through to polish stages sooner than the last batch. These new lenses are from different types of lighting fixtures so they are slightly different sizes. 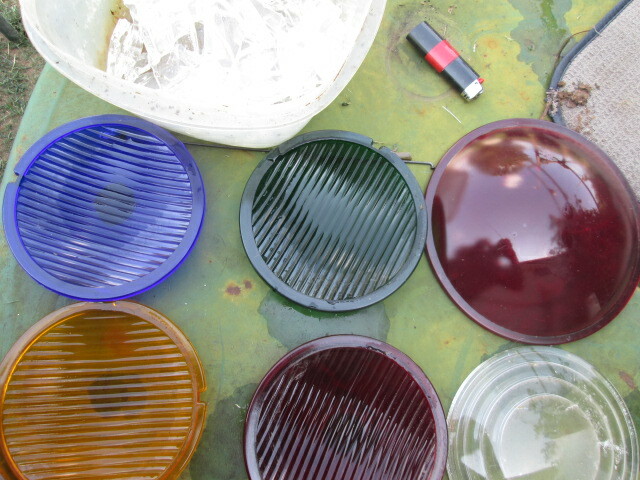 In the above picture, the lenses used in the last batch are the 2 on the right-hand side. This new batch is using the lenses with the lines in the lower-left corner. These are smaller and lighter colored than the last ones. I forgot to take a photo of the clear glass before I smashed it up. That lens was considerably larger and thicker than any of the other glass, almost 12 inches in diameter and 1/2 inch thick at the largest points. Those clear bits are in the plastic tub at the top. Will be tumbling again in a Lortone QT66 six pound barrel. 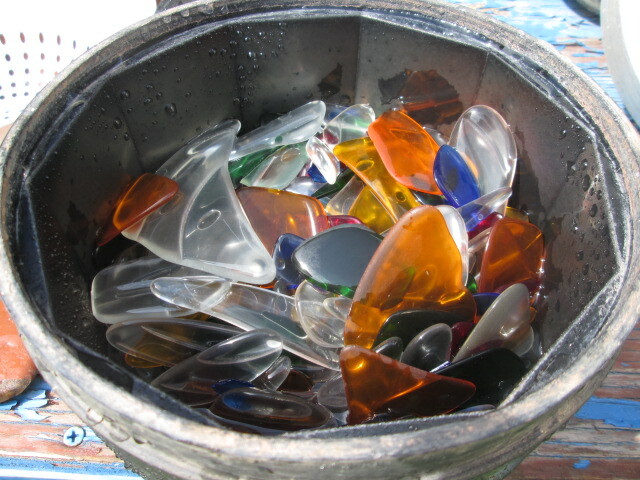 Got all the colored glass in the barrel and about a forth of the material from the large clear lens. Got it started this morning and will keep y'all informed . . .
How is the other batch coming along? Those are really cool, clear or not. Love the frosted ones with the ripples! I have a lot of borosilicate glass beads from various lampwork artists; supposedly they need a higher temperature torch for it, and it's generally more resistant to high temperatures than normal glass, they've also said it's harder. It's what's used for most coffee carafes, and a lot of glass bakeware for that reason. 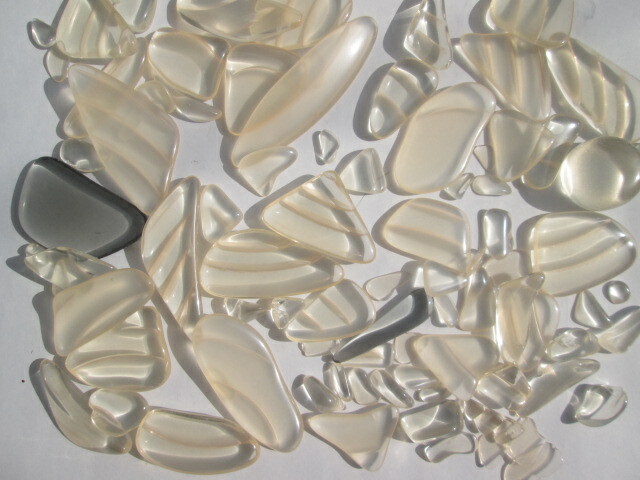 It can still suffer thermal shock and shatter more or less like any other glass, it's just more resistant to the high end. 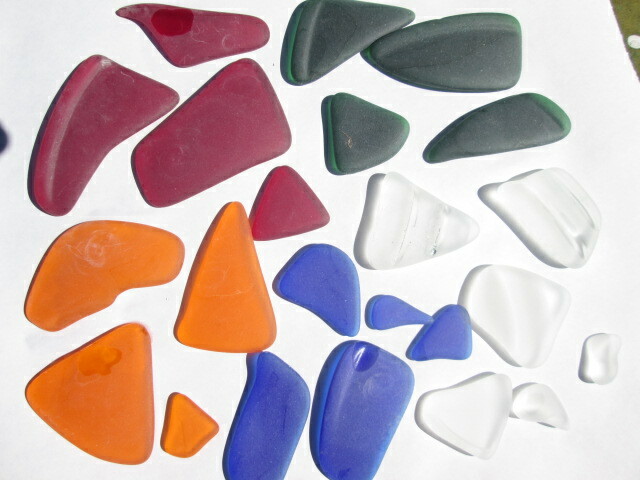 With some of the colors used for beadmaking, the appearance of the color can change dramatically under different light, so it might be interesting to see if any of those rods or pieces made from them ever show up! (We used to have to take pictures under indoor and outdoor light of the necklaces we made with the beads to make sure no one had any unpleasant surprises.) It's unlikely they would be used in the theater lights, since reliable color is the point there, but it's definitely out there. Feel free to peek at the stuff I'm working with here: s305.photobucket.com/albums/nn237/surreality3d/rocks/ -- nothing impressive yet, but hey, I guess we all start somewhere. I never tried to get a better shine than what I posted last. That glass was hard and it just needed a bit longer in the last coupla stages in the rotary. I'm still really happy with the results and my stagehand coworkers think it is really cool too. Did a cleanout on the New batch a coupla days ago on Tuesday. Most of the glass had been running stage 1 course for 2 weeks, but some of the clear had only been rolling for just 1 week. It all rounded off much more quickly this time, the glass was softer, or could be that there was less material in the barrels for stage 1. Decided to pass it All through to the polish stages. So now it's rolling in Stage 2 using 220 SiC. The barrel is about 85% full and I am going to do the polish stages Without using plastic beads this time, just glass and grit. Geez woofer, your glass has been a fun project to watch. I can tell you I tried getting a polish on glass for years using every trick in the book. may not be your intention. 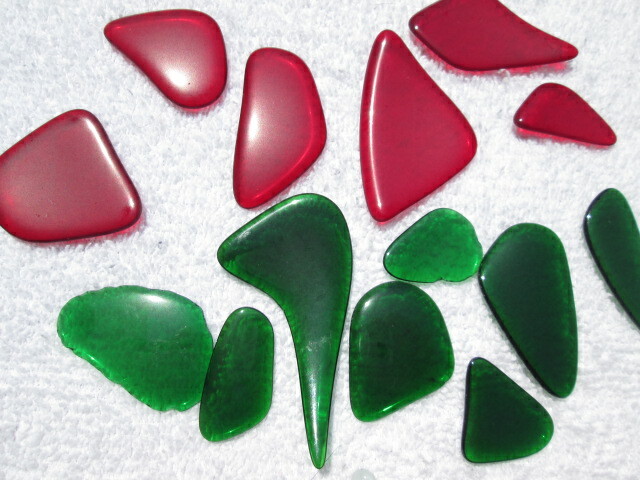 Conclusion was the tricky part is not shaping it in coarse grit, or the final polish with the help of a Lot-O. It is the prep for polish from 220 to 1000/4000(pre-polish). Or more accurately the AO 500 step to the AO 1000 step. But I do the AO 500 and AO 1000 step in the modified Vibrasonic with only using AO 220 and letting it breakdown to about AO 3000(pre-polish). But the deceptive part is that glass is so easy to get tiny microscopic bruises. You think it the abrasives going slow but it is micro bruises. 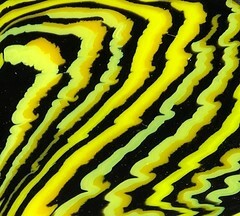 If your process takes a long time then it is damaging the glass on a microscopic level. I only use AO 220 and Rock Shed AO 14,000 polish in the vibes. 3, maybe 4 days for those 2 steps. SiC 60 and SiC 500 in the rotary before moving to vibe with AO 220. Yes a backward step. But SiC 500 is way more aggressive than AO 220. A world apart, SiC 500 removes a lot of glass, way more than AO 220. I could never get a polish on glass without my modified Vibrasonic to do the middle steps. It just has a way with glass because it is so gentle. I can not tell you why this machine gets the job done, I just know it is very gentle which is required for glass. The SiC 60 step can be done at high rotation speed, but the SiC 500 at slow rotation. So gentle. Most rock tumblers are not designed for glass. 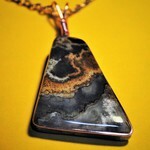 They are made for agates and harder rocks. Just the way it is. I forgot that yesterday (Tuesday) is my normal cleanout day, so I did cleanout before Sunrise this morning. Weather radar showed rain coming so I had to go early and fast since the cleanout sink is outdoors. This was preventing me from taking any pictures again, but it's not looking exciting yet anyway. In the last update I mentioned that I loaded the barrel 85% full with 220 grit, and it rolled for almost 8 days. When the barrel was popped open I was surprised that it was only filled about 50% now. 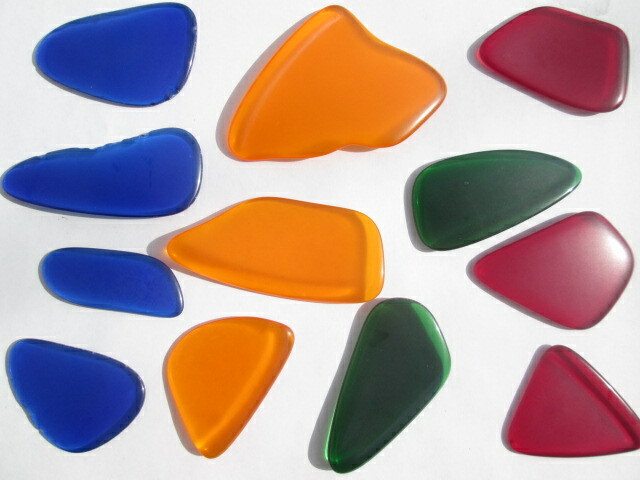 The Blue glass was getting very small and the parallel lines that were molded into the lenses was almost completely ground away. 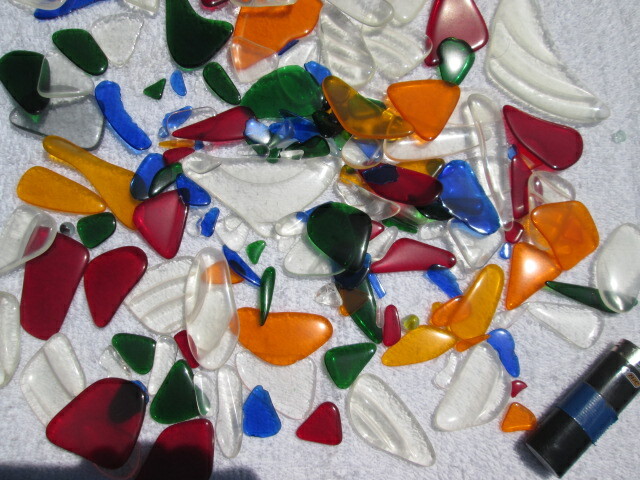 It's a big difference from the first batch of theater glass that I did earlier which seemed much harder. A large reduction of material but the stuff is rounded wonderfully. Did a 20 minute wash in plain water and filled to the 50% level using 600 SiC without using any plastic beads. I had hoped to have a fuller barrel through the polish process but still want to try this polish without any plastic beads this time. Once again, Tuesdays cleanout got pushed out to Wednesday morning. The reduction in material has been big with this batch and the barrel was less than 50% full. Was not wanting to use plastic beads with this batch, and 50% full was not enough to properly polish glass. So I decided to add all of the Theatrical Glass from the last batch to fill the barrel up to about 85%. That last batch had almost come to a clear polish but was still a bit cloudy so it really needed a little more attention to come up to a good shine. After a week rolling in 1000 AO prepolish the batch got washed with Ivory soap for an hour and I took pictures. Then it all got put into my Polish Barrel at about a 60% fill. Added water to the bottom of the top glass, added about 3 tablespoons of Cerium Oxide Polish Sealed it up and let it roll. Should be finished next week . . . The last batch came out of polish yesterday and here are the pictures. 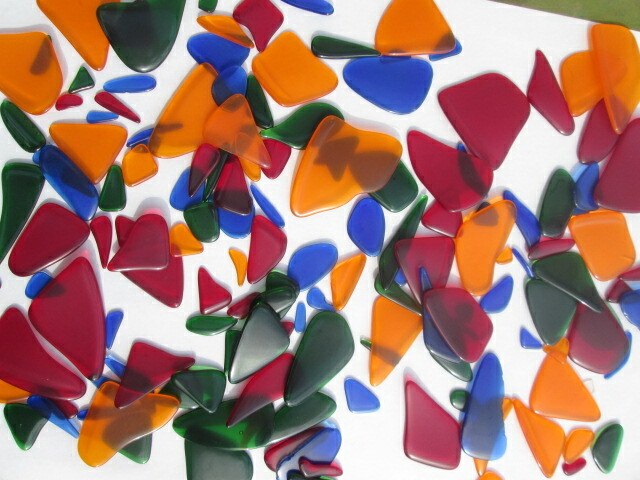 This is both of the batches of theater lighting glass that I've done and mixed together for the final polish. These are 2 pictures of half of the material. It came out amazingly shiny except for some haze and frosting around the edges of the larger pieces. Red & Green, the toughest of the colors, still a little hazy. A lot of this glass had parallel lines molded into them. After tumbling these lines have completely disappeared. 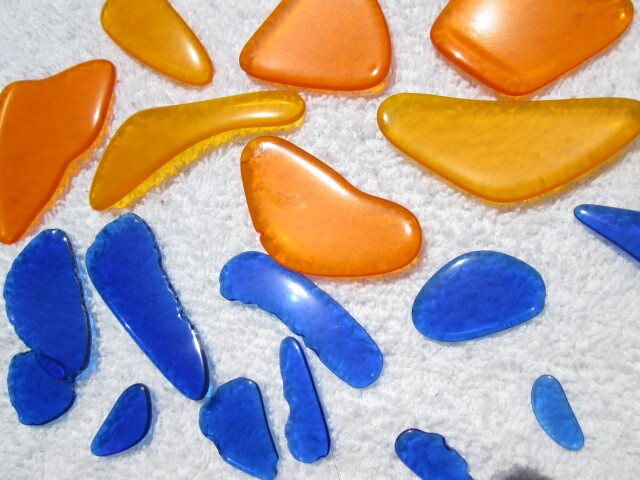 Orange & Blue, two different shades of orange, The blue was very weak and the pieces are much smaller than the other colors and rather chipped around the edges. These rough edges may be why the rest of the batch is hazy. Clear, these look amazing and the smaller the piece is, the more shinny and clear it is. The original radial lines held up very well and gives this glass lots of character.